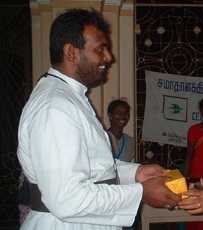 Fr Praveen OMI and Ruki Fernando Released! Ms Jayakumari Still Held. Fr. 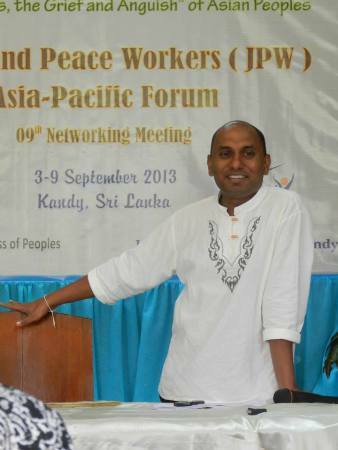 Praveen Mahesan OMI and Ruki Fernando, both staunch human rights defenders, were released from custody of the Criminal Investigation Division (CID) of the Sri Lankan government late Tuesday night. The two had been following up on the arrest of Ms Balendran Jayakumari, an outspoken critic of numerous ‘disappearances’, when they themselves were arrested. Ms Jayakumari, an activist who has vigorously protested the ‘disappearance’ of Tamils (including her son) since the end of the civil war in May 2009, is presently being held under a detention order in Boosa prison. By using a DO, she can be held for up to 18 months without formal charges. The Oblate JPIC Office is deeply concerned for her safety and well-being and joins an international demand for her unconditional release. Torture is alleged to be common in Sri Lanka. The arrests have taken place in the context of an alarming crackdown on human rights defenders and others protesting various abuses by government military forces, especially in the past five years.